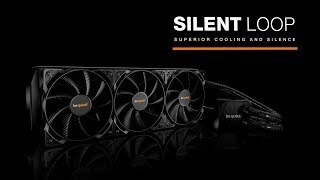 SILENT LOOP 360mm silent premium Water coolers from be quiet! Silent Loop 360mm brings the famous be quiet! whisper-silent technology to the world of All-in-One water cooling. The three high-quality be quiet! Pure Wings 2 120mm PWM fans combine outstanding reliability and silent cooling. Their silence-optimized fan blades reduce noise-generating turbulences while simultaneously increasing air pressure. This makes the fans the perfect partner for be quiet! Silent Loops high-performance full copper radiator.